Fielding wins the Swan Lake 15K Hunter Derby! The weather could not have been better the weekend of June 23, in Littleton, PA, and Fielding with amateur-owner Lindsay Mutschler in the irons had a great couple of days. 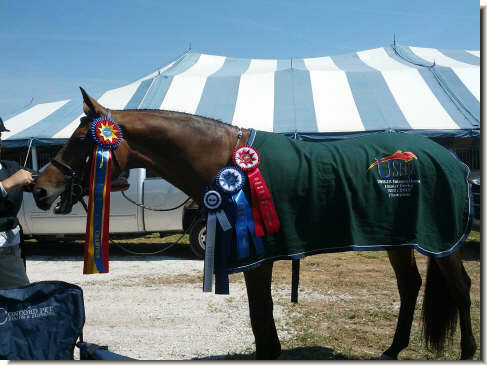 After winning the U/S and one of the O/F classes in the 3’6″ A/O under 35 division, this pair capped a very rewarding show by winning the 15K Hunter Derby on Sunday! There is one more Derby in their future before this pair heads to Indianapolis in August for the Traders Point Hunt Charity Horse show August 11, and then the quick drive from Indiana down to the Kentucky Horse Park and the USHJA Hunter Derby Finals August 17 & 18 ! « Sale on frozen doses at Hagyard has concluded.